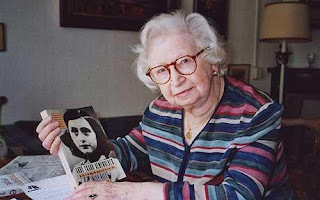 Yesterday afternoon brought the news that Miep Gies, one of the persons who hid and protected Anne Frank, died at the age of 100. She was born Hermine Santrouschitz on February 15, 1909 to a German Catholic family living in Vienna. At the age of 11, suffering from malnutrition brought on by post-World War I food shortages in Austria, she was separated from her parents and sent to the Netherlands. While living in Holland, her adoptive family bestowed on her the Dutch nickname “Miep.” In 1933, she began working as a secretary for Otto Frank, and married Jan Gies in 1941. When asked by her employer to help hide his family from Nazi deportation, Miep agreed unhesitatingly, despite great personal risk. From July 1942 to August 1944, Miep and her husband, with three others, protected the Franks and four others in a secret annex of rooms behind the office. On August 4, when the Gestapo raided the hiding place, Miep narrowly escaped being arrested. She later unsuccessfully tried to bribe the release of the families at the Gestapo headquarters in Amsterdam. Without the remarkable courage of this gentle woman, the world might never have known Anne Frank. With Miep and the others providing for their needs, Anne lived in hiding to write her diary, capturing her youthful spirit, and ultimately becoming a voice for those lost in the Holocaust. Miep recovered Anne’s diary and other writings from the ransacked rooms, keeping them for Anne's return. When Otto Frank, the only survivor, received word that his two daughters had died in Bergen-Belsen mere weeks before liberation, Miep gave him Anne’s diary, saying “Here is your daughter Anne's legacy to you." After the war, Miep lived quietly as a homemaker. As time passed, she and her husband were recognized for their efforts and in 1987 she was persuaded to write her memoirs. She travelled the world speaking to school children, making them aware of Anne’s story and the consequences of intolerance. Just as Anne became the voice and face of countless other young girls who were hidden and died during the Holocaust, Miep’s life represents all those good people who worked to save others and make a difference in those terrifying years. Though she received attention for her role, she very clearly reminded us she did not act alone. "I am not a hero. I stand at the end of the long, long line of good Dutch people who did what I did and more – much more – during those dark and terrible times years ago, but always like yesterday in the heart of those of us who bear witness." I keep thinking how I learned about Anne Frank in school. At first you identify with Anne, thinking of her in relation to your own age. Then thinking how she was the same age as someone you know personally - in my case, Anne was three and six years younger than my grandmothers. As I grew older and learned more about Miep and those who helped the Franks, I began to identify with them. What could it have been like living there at that time, wondering how you could do more? And it feels like Miep's death is another step in the passing of an era. Because with her death goes another tangible solid link to someone who participated, who was there, who witnessed. When all are gone and only their words survive, it is up to us to continue to teach their legacy of making the right decision and being willing to risk everything for what you know is right. May our world continue to produce those individuals willing to do the right thing in the face of such adversity. Thank you for such an inspiring post. I really enjoyed it.